Chris, about a 1-2-year-old Lab mix , was a stray from Southern Indiana so we don't know a lot about his history. Chris is about 60 lbs. and is just a sweet dog that loves getting some attention. On April 13th Chris was placed on a transport and headed to Illinois, which is when we started fostering him. So far things are going well. What we can tell you about Chris so far is that he is a great looking dog who is a very loyal, lovable dog and is about as happy as they come. He is super friendly and wouldn't say no to a being pet or played with. Chris just loves being around people and close to where you are. Chris is learning the routine where first thing in the morning we get up, go outside and go to the bathroom, then come inside and eat breakfast. Unfortunately, Chris' previous owners didn't teach him at all, so we are working on some manners and have Chris sit before we feed him. He also needs to learn that jumping up on people while excited is not an acceptable behavior. He seems receptive to learning but it will take some positive reinforcement. 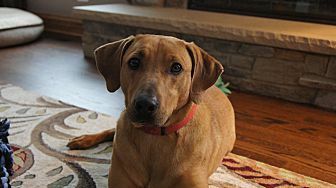 Chris likes other dogs and would do great in a home with another dog he could play with or would be fine by himself. We have a 65 lb. Shepherd of our own and the dogs do get along. Chris has shown interest in playing with toys, bones and balls thus far. He has not exhibited any type of aggression, with food or toys. Chris would probably help himself to a snack if you left food on the table due to his lack of training. Chris has been sleeping in his crate at nights and has been very good. He sleeps through the night and has not had any issues in his crate. Chris did have a couple accidents in the house the first day we had him but since then he has not gone in the house. As with all new fosters we make sure they get outside frequently and learn the routine and behavior we are looking for. All Chris wants is to be loved, played with, and given some attention. I would say Chris has a medium level of energy since he is young. Chris really enjoys exploring the outdoors and running around our fenced in backyard. He probably lived outside at his previous owner's house. 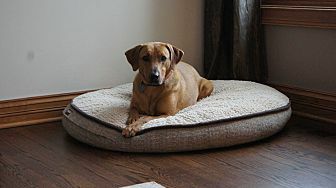 Chris also enjoys curling up in his dog bed and napping during the day. It would do Chris some good to have someone that is willing to spend some time with him, take him on walks, continue to get him some exercise and teach him how to be a great family dog. We would recommend obedience training with Chris. 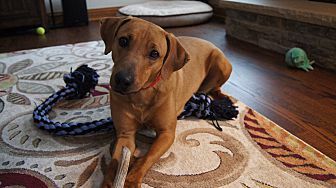 This great guy deserves a forever home and would make a great addition to your family. Chris is up to date on all his vaccinations, has been neutered and microchipped. For more information contact Mark or Karla at 630-881-8286 or e-mail us at [email protected] The adoption fee is $225.